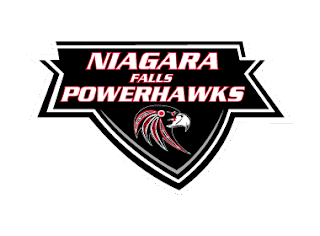 The visiting Jersey Shore Wildcats took the first game of a two game series against the Niagara Falls PowerHawks at the Hyde Park Ice Arena Saturday evening. The Wildcats skated off the ice with a 5-3 victory. The same two teams will face off Sunday afternoon at 1:00pm in Niagara Falls. The first period was a scoreless frame, but the second saw a flurry of five goals between the two teams. Jersey Shore tallied four of those goals, with Tim O’Connor netting the first one only 1:15 into the period. Dinmukhamed Dzhangarashev bumped their lead to 2-0 a minute later. Stephen Minichiello put Niagara Falls on the board 3:49 into the period on the power play, assisted by Andrew Logar. Jersey Shore put some distance between them and the PowerHawks when Michael Gulawski put the puck in the back of the net at 7:15. Reginald Hunter stretched the lead to 4-1 at 15:10. The PowerHawks took a 7-minute power play into the third period, hoping to stage a comeback. Niagara Falls was able to score two goals in the first minute of the third period to draw within one. Stephen Minichiello nabbed his second of the night only 28 seconds into the frame. He was assisted by Mitchell Thornton and Frankie Bodami. Andrew Logar scored 32 seconds later, assisted by Ryan Metzler. Both goals were on the power play. Jersey Shore closed out the scoring at 3:51 with a tally by Nick Ventura. The PowerHawks outshot the Wildcats 41-28. Theo Heropoulas made 23 stops for Niagara Falls. Nick Anastasia turned away 38 shots for the Wildcats. Niagara Falls scored all three goals on the power play. “We can skate with any team. We skated with Jersey all night. We had some breakdowns on our special teams that could have really turned the tide for us. We need to take those advantages when they come,” said PowerHawks general manager, Frank Vecchio. All Niagara Falls PowerHawks home games can be heard LIVE on niagaraswatercooler.com.